It was a medieval fantasy esque setting. It featured a world with some sort of king or dark lord that the protagonist was trying to defeat - for some reason, I don't remember why, this king was almost undefeatable. He could only be defeated by a secret word. Parts of the secret word were scattered around the land in syllables. The book begun with an ominous prologue in which a character had finally gathered all the parts of the word, and confronted the king - I think he might've been captured or something like that, and was brought before the king. When he said the word, it didn't work. I don't remember perfectly, but it might've been because the 'king' was an imposter, staged there to make the person say it and then the real king would come out. After saying the word, the person who said it immediately forgets it. 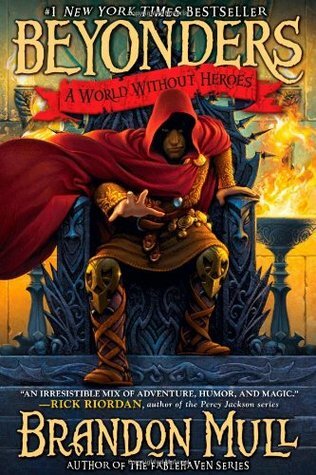 This is Beyonders: A World Without Heroes by Brandon Mull. After arriving at the blind king's decrepit keep, Jason learns that the "blind king" is really Galloran, a broken hero who already tried and failed on the same quest that Jason is now committed to. A few moments after learning of Galloran's true identity, Jason is introduced to Rachel, a girl his age from earth, who arrived in Lyrian by walking through a stone arch. Galloran then tells them that they are central to a prophecy spoken by a powerful seer, one in which they will destroy the tyrannical wizard emperor, Maldor. Galloran points out that the easiest (though still extremely difficult) way to accomplish this is to seek a Word of power that when spoken in Maldor's presence will theoretically destroy him. There are six syllables to The Word, the first of which had already been discovered by Jason at the repository of learning. Each syllable of The Word is protected by a guardian, each of whom will only reveal their syllable to those embarked on the quest to destroy Maldor. However, some syllables have also been written down (such as the one at the repository of learning), removing the necessity of directly seeking out the guardians of those syllables. They may only speak or write The Word in its entirety once, after which the individual that did so will forget it. Since Jason was the only one to read the book containing this information, Rachel may opt out. However, she decides to join him. Satisfied with their decision, Galloran presents Jason with a dagger whose blade shoots out of the handle at the pressing of a button on the pommel, while Rachel is given an orantium sphere, a type of grenade with an explosive crystal encased in glass that explodes when exposed to air or water. After being given a starting point by Galloran, Jason and Rachel embark on a very long quest for The Word.